Microsoft has delivered another pile of backward compatibility updates for owners of the Xbox One/S and Xbox One X. In the latest round of updates, Xbox One gamers have got 19 original Xbox games added to the backwards compatibility roster. For those more interested in enjoying their Xbox 360 titles on Microsoft's newest and most powerful gaming hardware, six such titles were updated with Xbox One X Enhancements. The original Xbox games backwards compatibility updates will be delivered in two waves; on 17th April, and on 26th April. You can refer to the table below for the games lists and timings. Checking through the above you will see lots of Star Wars games make an appearance in the second wave, and these are expected to be particularly popular with retro-gamers. There were already 13 original Xbox titles available for Xbox One gamers, so the new total at the end of April will be 32. Microsoft reminds us that "All of these Original Xbox games will take advantage of the power of Xbox One with up to 4X the pixel count on Xbox One and Xbox One S, and up to 16X the pixel count on Xbox One X". It delivers similarly impressive uplifts in quality with the six new Xbox 360 games with Xbox One X Enhancements. The roster of enhanced games is as follows; Sonic Generations, Darksiders, Gears of War 2, Portal 2, Red Dead Redemption, and Star Wars: The Force Unleashed. These play at 9X the original pixel count when played on Xbox One X.
VG247 is very impressed with the enhanced Red Dead Redemption on Xbox One X thanks to the backwards compatibility update. "When running on Xbox One X it looks absolutely ludicrous, outputting at a native 4K with a pretty steady frame rate and far crisper visuals," wrote the gaming magazine earlier today. A video it shared, embedded below, does a good job in demonstrating the uplift in visual quality. I'd say the visual change is like wiping Vaseline off a camera lens. 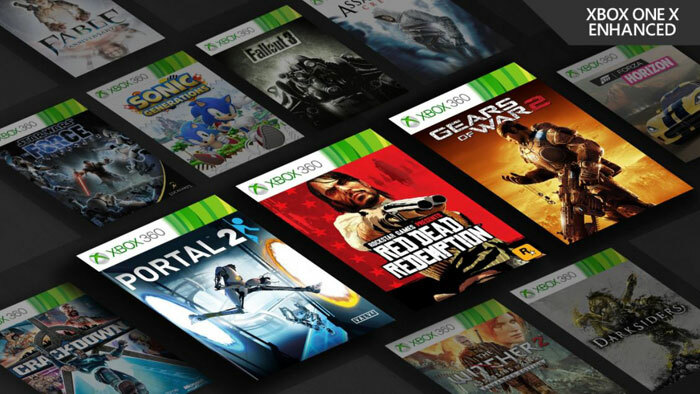 To play backwards compatible titles on your shiny new Xbox One hardware you can dust off and pop in your old games disc or purchase and download them digitally via the Microsoft Store. For the best quality in Xbox 360 titles such as Red Dead Redemption on Xbox One X you have to access the settings menu in the Xbox 360 guide, select Xbox One X Settings, then choose to optimise for graphics or performance.